Carpet art takes a special place in the history of culture of Azerbaijan and has become a symbol of the nation. 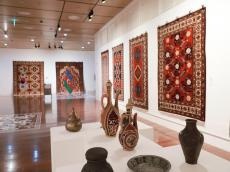 Today Azerbaijani carpets are represented in museums and at exhibitions in different cities of the world. An exhibition entitled "Carpets, Pearls of Azerbaijan" co-organized by Embassy of Azerbaijan in the Republic of Korea and the Korean Foundation, with the support of Azerkhalcha Open Joint Stock Company, has opened in Seoul. The exhibition, which will continue until December 19, is held at the Gallery of Korean Foundation, which has hosted a number of prestigious exhibitions, Azerkhalcha told Trend. As many as 18 Azerbaijani carpets of nine carpet groups (Baku, Karabakh, Gazakh, Guba, Ganja, Irevan, Nakhchivan, Shirvan, Tabriz) are demonstrated at the exhibition. The opening ceremony of the exhibition was held on November 28. At the opening ceremony, President of the Korea Foundation Sihyunq Lee noted that this exhibition dedicated to the 100th anniversary of the People's Republic of Azerbaijan is the first Azerbaijani carpet exhibition in Korea. Azerbaijan's ambassador to Korea Ramzi Teymurov appreciated Azerbaijani carpet exhibition for the first time in Korea as a historic event. The ambassador thanked the Korean Foundation, Azerkhalcha Open Joint Stock Company and Silk Way West Airlines for their support for the exhibition. Along with Azerbaijani carpets, national clothes, national musical instruments, souvenirs reflecting Azerbaijan, cultural samples, including magazines, books and brochures on Azerbaijani carpets were presented at the exhibition. A short video clip on the development history of Azerbaijani carpets was demonstrated at the exhibition hall. The Polaris TV channel, which broadcasts tourism opportunities of foreign countries in Korea, has prepared a special report from the exhibition. The Azerbaijan carpet weaving art was included in UNESCO's list of intangible heritage of humanity, at the 5th session of the UNESCO Intergovernmental Committee on Intangible Cultural Heritage, held in 2010 in Nairobi, Kenya. The world's first specialized carpet museum was created in Azerbaijan. The State Museum of Azerbaijani Carpet and Applied Art operates in Baku today. Azerbaijani carpets were exhibited in world famous museums such as Hermitage in St. Petersburg, Victoria and Albert in London, Textile in Washington, Louvre in Paris, Topkapi in Istanbul, Berlin Museum of Art, Metropolitan Museum of New York and the Museum of Art in Budapest. Azerbaijani carpets are divided into seven major carpet weaving schools distinguished by patterns, composition, color palette and techniques: Guba, Baku, Shirvan, Ganja, Gazakh, Karabakh, Tabriz. Another branch of carpet art is being developed by professional artists. Carpets based on their new ornaments and embellishments are of great importance in enriching classical compositions. Studying Azerbaijani carpet weaving and contemporary development of professional art of carpet weaving is linked to the name of Azerbaijani People's Artist, Latif Karimov. He has studied Azerbaijani carpets for many years, enriched the Azerbaijani decorative art with new ornaments, created new decorative motives based on traditional decorative elements.